Imagine a place where you can go to escape the outside world whilst being pampered in stylish surroundings. A place where you will be treated with professionalism, care and attention to detail. 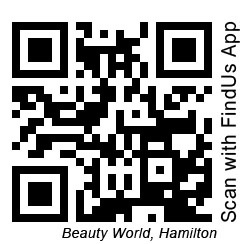 At Beauty World (Hamilton) we make this a reality. Come on in to experience our popular luxurious facials and ultra-hygenic waxing in private, well appointed rooms. Beauty escapes into a world of total comfort, relaxation, and rejuvenation. Body treatments and skin treatments as well as quality services and products with scientifically-proven and natural ingredients. Experience the Total Package with our fully qualified therapists. GIFT VOUCHERS AVAILABLE in salon or order online! We pride ourselves in providing an excellent service to you our client. We offer most beauty services to female & male clients. Book an appointment! Beauty World Team would love to see you. For all treatments you must have a consultation first before starting your treatment plans. For April your 1st session half price. We offer professional training workshops.